LOS ANGELES – Apr. 19, 2018 – In accordance with the Apr. 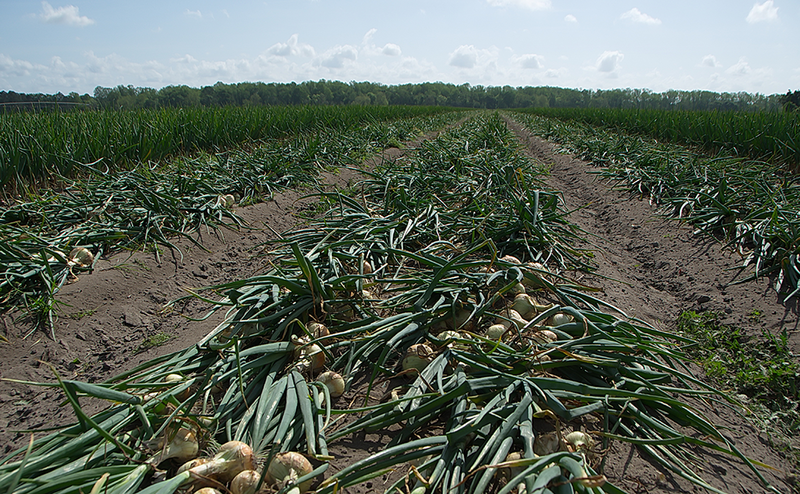 20 start date announced by the Vidalia® Onion Committee, Giumarra will begin shipping both organic and conventional Vidalia onions the third week of April. Giumarra Southeast is pleased to offer promotable volumes of Nature’s Partner-brand Vidalia onions in bulk and bagged pack styles. Now in the third year of its onion program, Giumarra is continuing to offer Vidalia and sweet onions in partnership with G&R Farms of Glennville, Georgia. “We know that organics are of growing importance to consumers, and we are excited to offer our customers an organic option for this summer favorite,” says Kristina Lorusso, Regional Business Development Director for Giumarra. Giumarra’s domestic Vidalia onion season is complemented by Peruvian sweet onions to round out a 12-month sweet onion supply, all loading from the same location in Glennville, Georgia. The Vidalia onion harvest at G&R Farms in Glennville, Georgia. Access high resolution image. Freshly-pulled Vidalia onions. Access high resolution image.